Personally, I find calling Mastodon’s direction since and including 2006’s Blood Mountain ’weak’ or ‘soft’ as some have, is a little precious and self-serving. Understanding that yes, this was a band that by 2004 had released two albums and a compilation of early material that defined and converted a new wave of fans to extreme “sludge metal” (peaking with arguably their most valued work to date, Leviathan), does not necessarily suggest that their more hard rock orientated approach nowadays should not be held on the same pedestal. Is The Hunter metal? In its purest form, no, not really. Is it heavy? Yes - at least when it wants to be. In the end it’s proving easier to be disappointed than it is to stretch your boundaries and in the case of this new release, acknowledge, understand and appreciate what the band is willing to do to evolve their sound. I won’t disrespect an ideal or direction from somebody if it’s done with passion and talent like in the case with Hunter. Plus I’m far too old to hold it against a band because ‘Curl of the Burl’ will reach a wider audience due to it becoming a (potential) radio staple despite once producing such trudging heaviness like ‘March of the Fire Ants’ for example. Clinging onto what defines “underground” and refusing to accept something good because it doesn’t fit into some conceited notion is lost on me. I’ve grown up, matured, evolved my tastes and moved on. 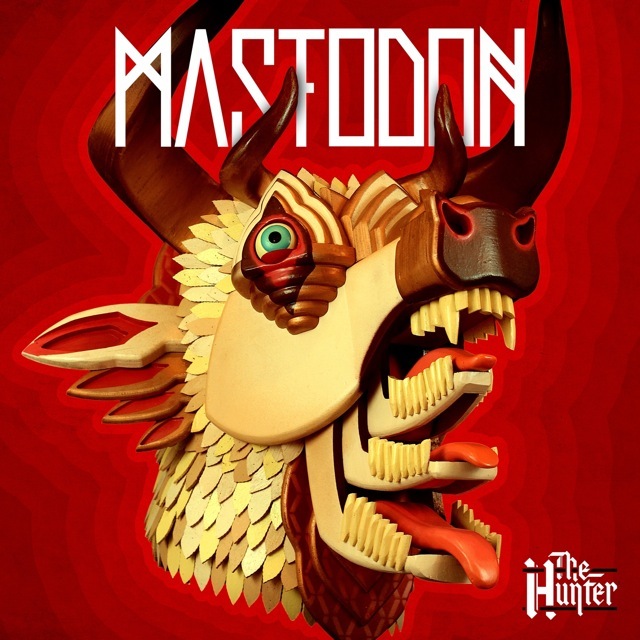 On Hunter, Mastodon seem to have as well, and once the layers of the album reveal itself after several listens, calls of compromise towards them is a laughable offence in my humble opinion. I admit since discovering them in 2005 after hearing the track, ‘Seabeast’, I may be a tad bias in my view on them, having garnered a distinctive amount of respect reserved for only those who leave the deepest impression. But enough ranting, it’s onto the songs themselves. When Hunter opens with the almost evil sounding ‘Black Tongue’, the crispness of the production is like a punch in the face. Have they ever sounded this pristine? When you hire a pop/hip-hop producer (namely Mike Elizondo), it’s no surprise, even if the idea itself already has some fans balking. Mastodon deserve to sound this good though. The gigantic riff that swaggers through the opening track earns the right to polish – loud enough to level buildings. The instant classic (and first single) that follows, ‘Curl of the Burl’, is an audacious addictive rock feat for the band. Brann Dailor suggested that Hunter was more focused on groove; ‘Burl’ is a thick, groove stew. ‘Blasteroid’ and ‘Octopus Has no Friends’ are headed for fan favourite status as Hind’s guitar wizardry blasts its way through the verses and as becomes clear through the rest of the disc, the vocals (provided by Hinds, Sanders and Dailor throughout) are a major breakthrough. For long-time fans, hearing some of the vocal harmonies on these tracks (as well ‘Stargasm’ and the 50’s B-Grade inducing ‘Bedazzled Fingernails’) is a minor revelation. Mountain and Skye showed that despite it being the weakest arsenal in their cannon, vocally everyone is challenging themselves to be able play want they want. The singing is sometimes so jaw droppingly good for them, calls of studio trickery are abound. Personally it's fair to say some things may have come into play, but I will give the band the benefit of the doubt (and especially Sanders) that they have genuinely improved immensely. As the album continues on through its 13 tracks, the level of consistency starts to become clear. It’s hard to fault any of the songs despite the varied styles being employed. ‘Stargasm’ is possibly the pick of the bunch with its spacey syths under the decidedly melancholy chorus juxtaposed amongst the chugging riff of the verses. The title track is the albums closest link to 2009’s Skye. A touching meditation by Hinds of his brothers untimely death, it’s simple lyrics and epic rock construction make it a highlight with fittingly, possibly Hind’s best solo ever put to wax. From then on, the more meat and potatoes additions appear with ‘Dry Bone Valley’ and ‘Thickening’ proving to be, if not overly exceptional themselves, solid heavy rock tunes that once again, drip with an addictive quality that seems to cover all of Hunter. ‘Spectralight’ is the closest song that harks back to the ‘sludge’ era and is a complete assault via Dailor’s pummelling drums and the twin attack of Melvin’s inspired guitar fuzz. Added to the intensity, is Neurosis lead singer, Scott Kelly, who provides most of the vocals here. ‘Creature Lives’ is the clear oddity that while it sticks out considerably amongst the band’s repertoire, the song itself is a wonderful inclusion and cements their infallible quirky nature. The album closes elegantly with ‘The Sparrow’, an almost instrumental, layered to reach a classic rock crescendo. On the surface, this is a Mastodon like they’ve never sounded before, but pure in that it is unmistakeably them and ultimately, it is not really that much of a departure if you follow the band and their often revealed inspirations. Not many bands can truly be proud of turning the corner, making something for themselves that is as every bit enjoyable as it is technically proficient and not lose their passion. It’s a bit hard to explain, but while some will cry foul that there is nothing extreme enough to frighten you're parents, Hunter sounds like a band who’s found their niche, is happy where they’re at yet still striving to create interesting music and challenging their ability as songwriters. If this band has any commercial success agendas besides that, they’ve certainly got me fooled. I’ll wait a while yet before I start casting stones for such a thing anyway. Credit where credit is due and The Hunter is an exhibit for the court that Mastodon is ready to take over the world of Hard Rock – and so they should.